Home to the businesses in our community that won’t take responsibility for helping prevent the spread of disease by providing paid sick days to keep their employees and customers healthy. 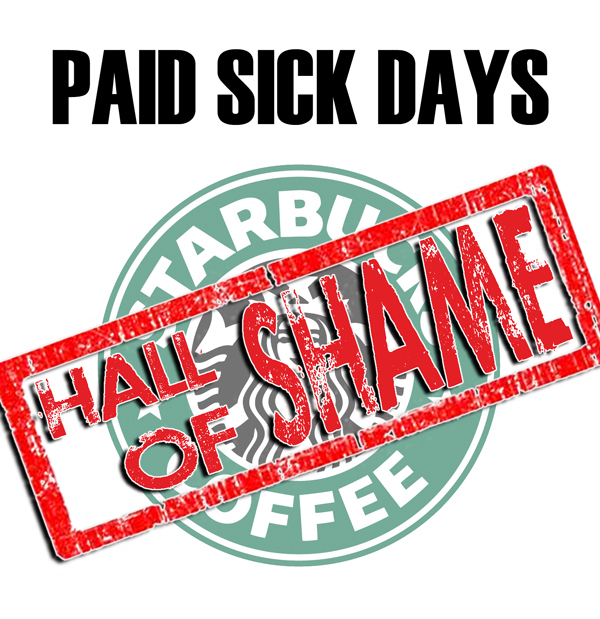 Starbucks provides paid sick leave to corporate employees and managers – but if you’re a barista pulling shots, or a cashier in one of their retail stores (actually handling food and drinks for hundreds of people a day), no dice. That’s pretty bad behavior right there. But it gets worse: In July 2009, CEO Howard Shultz told his U.S. retail employees the company couldn’t afford to provide personal days to them anymore – the only way they were able take a sick day without taking a pay cut. The truth is that Starbucks can well afford to take responsibility for keeping our community healthy – the company had $1.4 billion in profits in 2010 – as indicated by the fact the company provides paid sick days to retail employees in other countries (Chile, Greece, China…the list goes on). That’s just plain shameful. After hearing from workers at several Jimmy John’s franchises – people who handle thousands of meals a day – that their employer doesn’t provide paid sick time, we sent a certified letter to the parent corporation of Seattle’s local Jimmy John’s outlets asking them whether paid sick time was available to their retail employees. Unlike the many local businesses who have stepped up to support paid sick days in Seattle, we heard nothing back from Jimmy John’s corporate owners. For a company that boasts of their franchises netting nearly $300,000 a year, that merits their induction into Seattle’s Paid Sick Days Hall of Shame. 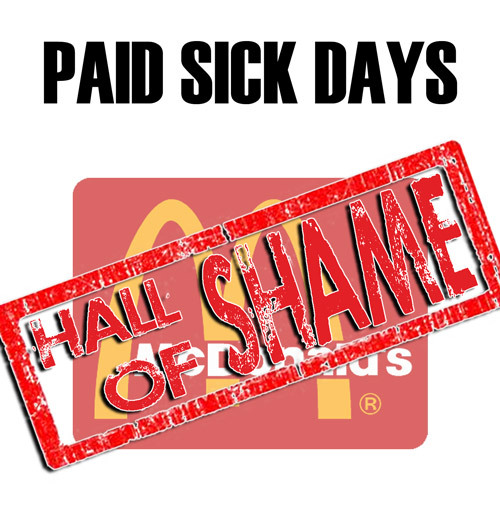 McDonald’s, which boasts serving 60 million customers per day, profits of nearly $5 billion in 2010 and 400,000+ employees, can certainly afford to provide paid sick days to its employees. Representing yet another billion dollar corporation in Seattle’s Paid Sick Days Hall of Shame that does not allow its frontline workers to earn paid sick days, McDonald’s should be ashamed of itself for putting profits over people. KIRO-TV should be added to the Hall of Shame. Yes, they provide paid sick days. BUT, last year when my wife, who was still employed as receptionist (after several years in that position) had pneumonia, even after two notes from her doctor and $300.00 in prescription she was written up for “taking to many sick days.” She has since been dismissed in and outsourcing maneuver.